A pulse is an annual leguminous crop yielding from one to twelve seeds of variable size, shape, and color within a pod. Pulses are used for food and animal feed. Archaeologists have discovered traces of pulse production around Ravi River (Punjab), the seat of the Indus Valley civilization, dating circa 3300 BC. Meanwhile, evidence of lentil cultivation has also been found in Egyptian pyramids and dry pea seeds have been discovered in a Swiss village that are believed to date back to the Stone Age. Archaeological evidence suggests that these peas must have been grown in the eastern Mediterranean and Mesopotamia regions at least 5,000 years ago and in Britain as early as the 11th century. The term "pulse", as used by the Food and Agricultural Organization (FAO), is reserved for crops harvested solely for the dry seed. This excludes green beans and green peas, which are considered vegetable crops. Also excluded are crops that are mainly grown for oil extraction (oilseeds like soybeans and peanuts), and crops which are used exclusively for sowing (clovers, alfalfa). However, in common use these distinctions are not clearly made, and many of the varieties so classified and given below are also used as vegetables, with their beans in pods while young; cooked in whole cuisines; and sold for the purpose; for example, black eyed beans, lima beans and Toor or pigeon peas are thus eaten as fresh green beans, or cooked as part of a meal. Pulses are important food crops due to their high protein and essential amino acid content. Like many leguminous crops, pulses play a key role in crop rotation due to their ability to fix nitrogen. There are several varieties of pulses in India, most of them locally produced and consumed. The three most popular crops are chick pea, pigeon pea and rajma. Chickpea : Chickpeas (Cicer arietinum) are also known as bengal gram and garbanzo beans. In India they are known as chana. They are believed to have originated in southwestern Turkey. They are one of the earliest cultivated pulses, having been grown for over seven millennia, and currently account for almost 40 per cent of total pulse production. India produces over 68 per cent of the world's chickpeas. Chickpeas are a cool season annual crop. They produce good yields in drier conditions because of their deep tap root. The two main varieties are desi and kabuli. Seeds of the desi variety are smaller, darker and have a rougher coat and a much higher fibre content. The desi types are mostly found in the Indian subcontinent, Iran, Ethiopia and parts of central America, whereas the kabuli types are commonly found throughout southern Europe, Western Asia, the Nile Valley, North Africa and South America. 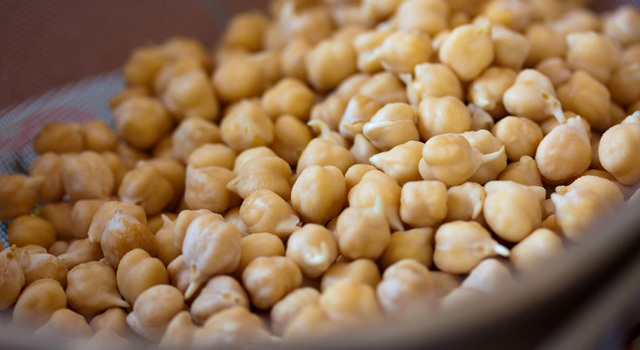 Chickpeas are a good source of protein, copper, folate, phosphorus, zinc, magnesium, manganese, and vitamin B6. Pigeonpea: Pigeonpeas (Cajanus cajan) are also known as red gram. In India, they are known as toor or arhar. They are believed to have originated in Asia; some experts believe them to be of Indian origin, while others believe they originated in the Middle East. They have been cultivated for over 3,000 years, and, in addition to the use of their seeds as a food crop, the woody stems of the plant are valuable as firewood and as fencing and thatch. The plants are noted for their ability to grow in a wider range of soil types than most legumes. Pigeonpeas are a good source of protein, thiamin, magnesium, phosphorus, potassium, copper, folate and manganese. Cowpea: Cowpeas (Vigna unguiculata), also called blackeyed peas, are known as lobiya in India. The crop originated in Africa, probably in the southeast, and has been cultivated for five millennia. Cowpea is a warm season crop that grows well in tropical and temperate zones. It can tolerate heat well and is also quite drought resistant, but it is intolerant of frost. The seed coat can be either smooth or wrinkled and of various colours, including white, cream, green, buff, red, brown, and black. The seed may also be speckled, mottled, or blotchy. The seed coat sometimes consists of a white-coloured hilum that is surrounded by another colour. The plant is known for its drought and shade tolerance, the former due to its tendency to form a tap root, the latter making it especially well suited to intercropping. It is also a good crop for sandy soil. Cowpeas are a good source of protein, thiamine, iron, zinc, magnesium, phosphorus, potassium, copper, folate and manganese. Urad bean: Urad beans (Vigna mungo) are also known as black lentils or black gram. In India, they are known as urad. When whole, they are also called black gram, and when dehusked, they are known as white lentils. They originated and were first domesticated in India and are mentioned in Vedic texts. Urad beans are a good source of protein, thiamin, iron, magnesium, phosphorus, copper, and manganese. Red kidney bean: Red kidney beans (Phaseolus vulgaris), known in India as rajma, were given the latter name for their resemblance to the human kidney, due to their shape and dark red colour. The crop was domesticated in South America. Red kidney beans are a good source of protein, thiamin, magnesium, phosphorus, potassium, copper, folate and manganese. Mung bean: Mung beans (Vigna radiata), or green gram, are known in India as moong, and are native to northeastern India and Myanmar. The seed is not generally treated with fungicides, insecticides or bactericides because of the likelihood that the seed itself may be ingested. Mung beans are responsive to length of daylight — shorter days hasten flowering, and longer days delay it. Mung bean has an ovoid shape and a green husk. Once it has been dehusked, it is yellow and is known as moong dal. The items commonly sold as “bean sprouts” are usually mung bean sprouts. In East Asian cooking, translucent noodles and vegetable roll wrappings are made from mung bean starch or flour. Mung beans are a good source of protein, thiamin, iron, magnesium, phosphorus, potassium, copper, folate and manganese. The crop is believed to be native to the Near East. Red lentils are only red once they've been dehusked — prior to dehusking, they have a brown skin. They are a good source of thiamin, iron, phosphorus, manganese and folate.